This is a paper I wrote for a presentation I just gave in Lima, Peru to a group of Automation Professionals sponsored by TECSUP. It is also my first blog update using the MS Word tool so the formatting is a little off. More practice needed there. One thing of note is that it killed all of my references which I have pasted at the bottom. Automation as a profession has suffered from a long overdue lack of recognition. As our manufacturing plants continue their path to efficiency and productivity, automation will play an increasingly critical role. Fortunately, many things are converging to elevate the profession to the prominence it needs and deserves to be the player in shaping the factory of the future. This paper is a compilation of many sources of information and describes the many efforts underway to accomplish the important task of promoting the profession. Disclaimer – Many portions of this paper are direct copies from other sources and the author has made every attempt to credit these sources. The author acknowledges that this paper is compilation of the information available. The reasoning for this copy is to maintain consistency of the message and acknowledge the great work that has gone on before this paper was written. What Does It Mean to be a “Profession”? For automation, it takes an expanded meaning still as the profession is so vast. It encompasses professionals from many different backgrounds, specialties, training, education, roles and experience. All of these careers are interwoven into the fabric of the automation profession. Automation involves technicians, engineers, scientists and other professionals. These highly skilled individuals come from industry, academia, and government around the world. It is our job to bring them all together and advance the efforts in a collaborative and efficient way to benefit all mankind. It is our responsibility to provide good stewardship for the profession! Why is Automation an Unknown Profession? Why has such a critical occupation not been recognized and defined as a profession until recently? Unfortunately, most of the blame can be placed on those in the profession. As with most technical people, we struggle with clearly communicating to those other than our colleagues. We are too busy solving the problems in front of us to talk about them with others. When we do communicate about our profession, we tend to use a lot of acronyms and technical language that most people don’t understand. This is even true in our jobs when we are communicating with managers and peers. Many of us find it quite difficult to tell someone what we do for a living. And when we do describe it, people will tend to simplify it to something they can understand, like calling it “robotics”. Another challenge comes from the fact that there are many specific subsets of automation, from technicians to researchers to sales. In many cases, these jobs look very different to the outsider but are actually all part of the same overall profession. In manufacturing, we don’t actually build the product but the plant could not produce the product without us. The term “manufacturing” is used in this paper in the broadest of meanings encompassing all industries (Process, Oil and Gas, Chemical, Food, Beverage, Pharmaceuticals, Batch, Continuous, Discrete, Robotics, etc). We operate in the background. In fact, nothing can be made in today’s global economy without some form of automation. Unfortunately, we still suffer from an identity crisis. Combine these items with an inaccurate and negative perception of manufacturing being a dirty place to work with dead end careers, and the profession suffers another blow. Further evidence of this occurred in the early 2000’s, when the International Society of Automation (ISA) conducted market research into the recognition of the automation profession. The findings were good and bad. The good message was that automation did not have a bad reputation. However, the bad message was that automation had no reputation. The overwhelming majority of the public does not know who we are and does not understand what we do. As budgets tighten and staffs reduce, many firms are no longer able to train and mentor new workers in the ways of automation. They are no longer able to fund trips to conferences and supplier shows to learn new technologies and stay abreast of trends in the industry. The time commitment required of these folks to perform their primary jobs prevents them from being able to learn, volunteer in professional societies, network and and stay connected on their own. Many issues converge to prevent the profession from becoming well known and a choice career for young people. Without the time to promote the profession individually, we all suffer as our workloads continue to get larger as our management does not understand the value we bring to bear. But we must not let the urgent continue to take priority over the important. Automation crosses all functions within industry from installation, integration, and maintenance to design, procurement, and management. Automation even reaches into the other functions such as health, safety, marketing, sales and more. Automation involves a very broad range of technologies including instrumentation, control systems engineering, robotics and expert systems, telemetry and communications, electro-optics, Cybersecurity, process measurement and control, sensors, wireless applications, systems integration, test measurement, and many, many more. A “Competency Model” is a formal federal document that clearly defines what a person needs to know and be able to do to perform well in an occupation—the knowledge, skills, and abilities required. Competency models are developed through research and industry validation; and, once completed, are promoted, maintained, and updated. In 2009, the Automation Federation, in collaboration with the Employment and Training Administration (ETA) of the U.S. Department of Labor (DOL), completed the Automation Competency Model (the first produced by the DOL). Automation industry leaders and ETA staff worked together to develop this comprehensive competency model for careers in automation with the intent of aiding and increasing the number of individuals pursuing careers in this vital profession. In addition to the expertise contributed by industry leaders, A Guide to the Automation Body of Knowledge, 2nd Edition, Vernon L. Trevathan, editor, served as the basis for the technical competencies portions of the model. The model also incorporates all of the technical domains of a Certified Control Systems Technician® (CCST) and Certified Automation Professional® (CAP) as explained later in this paper. The model is a web-based, interactive tool describing the competencies required for a career in automation. The user should access the model online and take advantage of the tools built into it. If that is not feasible, one can download additional tools including a spreadsheet and a paper from the website that fully describes all of the pieces of the model. The following is an excerpt from that document. 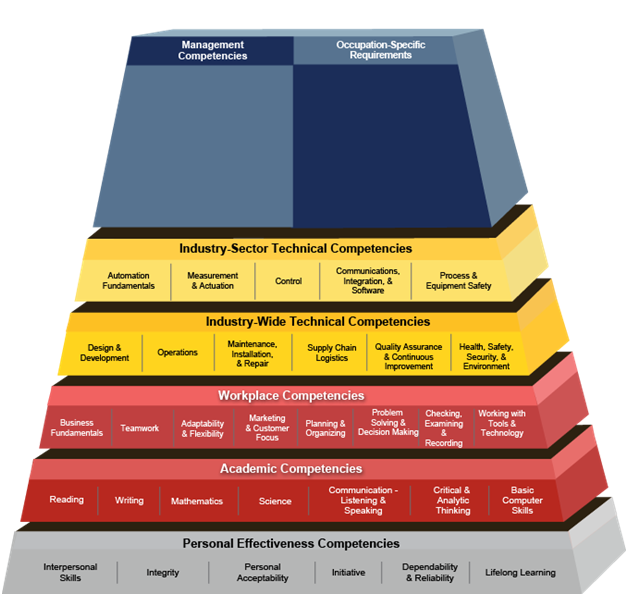 The Automation Competency Model is depicted in a pyramid graphic with nine tiers. This shape illustrates how occupational and industry competencies build on a foundation of personal effectiveness, academic, and workplace competencies. Each tier is comprised of blocks representing the skills, knowledge, and abilities essential for successful performance in the industry or occupation represented by the model. At the base of the model, the competencies apply to a large number of occupations and industries. As a user moves up the model, the competencies become industry and occupation specific. However, the graphic is not intended to represent a sequence of competency attainment or suggest that certain competencies are of greater value or higher skill than others. The graphic is accompanied by a table which contains definitions and associated key behaviors for each competency block. Tiers 1 through 3, called Foundation Competencies, form the foundation needed to be ready to enter the workplace. Tier 1 – Personal Effectiveness Competencies are shown as hovering below the pyramid because they represent personal attributes or “soft skills” that may present some challenges to teach or assess. Essential for all life roles, personal effectiveness competencies generally are learned in the home or community and reinforced at school and in the workplace. Tier 2 – Academic Competencies are critical competencies primarily learned in a school setting. They include cognitive functions and thinking styles, and are likely to apply to most industries and occupations. Tier 3 – Workplace Competencies represent motives and traits, as well as interpersonal and self-management styles honed in the workplace. They generally are applicable to a large number of occupations and industries. Tiers 4 and 5, called Industry Competencies, show competencies that are specific to the industry or industry sector. The cross-cutting industry-wide technical competencies make it possible to show career lattices within an industry wherein a worker can move easily across industry sub-sectors. As a result, this model supports the development of an agile workforce, rather than narrowly following a single occupational career ladder. Tier 4 – Industry-Wide Technical Competencies represent the knowledge and skills that are common across the sectors within a broader industry. These technical competencies build on, but are more specific than, a competency represented on a lower tier. Tier 5 – Industry-Sector Technical Competencies represent a sub-set of industry technical competencies that are specific to an industry sector, in this case Automation. Development of the technical competencies relied heavily on A Guide to the Automation Body of Knowledge, 2nd Edition, Vernon L. Trevathan, Editor. A three year update occurred in June, 2011 and the additional job description for Advanced Process Control Engineer was added. In order to maintain the model, a review is required every three years at a minimum. These reviews look at the current status of the profession and ensure the model fits. Where it is lacking, it is improved. Professionals from all over the automation profession are solicited for input such that a good cross section of knowledge is accounted for. Why is the Automation Professional Important? Think about the cell phone and computer you use every day to do your job. Think about the car you drive to take to work. Think about the food you eat; water you drink; clothes you wear; and appliances you use to store, prepare, and clean them. Think about the television you watch, video games you play, or music system you listen to. Think about the buildings you visit. Think about any modern convenience or necessity. Just about anything you can think of is the result of complex processes. Without talented individuals to design, build, improve, and maintain these processes, these technological advances would never have occurred and future innovations would be impossible. Without automation professionals, our world and our future would be very different. We are living in a world made up of a system of systems and the complexity is expected to change at an ever increasing pace. It is the automation professional that uniquely understands the interactions and inter-dynamics of such complex designs. Automation professionals are responsible for solving complex problems in many vital aspects of industry and its processes. The work of automation professionals is critically important to the preservation of the health, safety, and welfare of the public and to the sustainability and enhancement of our quality of life. Whereas this effort has gained the most momentum in the US to date due to the locality of the volunteers driving the efforts, the groundwork established is quickly translating into accelerated work in other areas of the world. Recent meetings in Brussels, Belgium concluded with action plans in place to have the model adopted by the European Union. Brazil is looking at the model and the certifications to be a regulatory requirement for automation professionals. In 1992 in the US, the Control System Engineer® (CSE) was adopted as a Professional Engineering license. CSE’s now number in the 2000’s. A CSE understands the science of instrumentation and the automatic control of dynamic processes. Introduced in 1995, the Certified Control Systems Technician® (CCST) works to provide a common level of skills and competency. Now in use globally by over 40 companies to validate personnel in the fundamental skills required to perform their jobs, the number of CCST’s worldwide is over 4000 while over 9000 have applied to take the exam. CCSTs are knowledgeable and skilled in pneumatic, mechanical, and electronic instrumentation. They understand process control loops, and process control systems including computer based systems. In the 2000’s, long time automation professional Vernon Trevathan gathered a group of automation practitioners and developed A Guide to the Automation Body of Knowledge (AutoBOK). This book then served to foster a global certification launched in 2004 named the Certified Automation Professional® (CAP). CAPs are responsible for the direction, definition, design, development/application, deployment, documentation, and support of systems, software, and equipment used in control systems, manufacturing information systems, systems integration, and operational consulting. CAPs worldwide number in the 400’s and are growing. The AF has worked diligently to increase the awareness of the automation profession with the public and government. Whereas the bulk of its work has taken place in the US, that work has established the framework for other governments which are now looking at and adopting the competency model and certifications. A large effort is now underway internationally to promote the profession. Work has begun in the EU, Canada, Brazil and India. The AF and its members are working to increase the awareness of engineering and technical disciplines. We are working to promote Science, Technology, Engineering and Math (STEM) to young people in lower grades so they stay interested in these fields as they move into upper grades and into universities. In addition to STEM, AF is working to change the perception of manufacturing being a dirty, unstable job. Our world economy cannot function if it does not make anything. Advanced Manufacturing is critical to economic stability and well paying jobs. And the key to manufacturing is automation. For all automation professionals, the advantage is huge. Manufacturing’s reliance on automation professionals will only increase. The profession of automation is expanding to include new industries such as Building Automation. The solutions to the world’s economic and environmental challenges will require involvement from automation. By defining the profession through the Automation Competency Model, academia can use its resources to develop curriculum for certificate, 2 year technical and 4 year engineering degrees. As they will be based on the model, the users of these professionals can be guaranteed a high level of competency when hiring. By having a profession defined, the quality of the professionals we must interact with increases and the quality and impact of the solutions developed will also increase. Some of the world’s toughest problems will be solved by automation professionals. With a profession, the ability to network and communicate with other peers becomes easier. Identifying technology trends and driving those trends to meet industry need becomes less challenging. Influencing manufacturing policy as it relates to safety, quality, productivity and technology becomes easier. More importantly, automation is invited to the table when important discussions take place. We become a legitimate force in the multidisciplinary engineering effort to solve the Grand Challenges of the world. Automation will get involved much earlier in projects as it can single handedly impact the success or failure of a project more than any other discipline. Since automation is often seen as a solution where other efforts fail, it only makes sense that we get involved earlier in the project. Our hope is that one day we will see Chief Automation Officers driving global automation initiatives within manufactures yielding the promised returns on investment. We will stop implementing technology for the sake of technology and as Peter Martin says in his book, Bottom Line Automation, we will start implementing technology for the bottom line. We will develop automatic processes instead of automating manual ones. As our prominence elevates, the value of what we can do for our manufacturers will come to light. We will finally be recognized for producing the results automation promises. When a career in automation is a known and respected choice around the world, we will know we have arrived. At present, the great majority of automation professionals have accidentally found their way into this career. We no longer can afford to have Automation be known as the accidental profession or an outpost on the journey of life, it must become a destination pursuit that is pursued by many from a very young age. Practicing automation professionals must be recognized among the best and brightest minds from the scientific and engineering community. We must be seen as a peer group from the more established and traditional engineering fields. Moving the profession forward requires assistance from all automation professionals. We are gaining momentum at many levels of the government and in the public discourse. We need your help as we continue to promote the profession. We need regional contacts for government, academia, companies and others that can impact the profession. We need you to drive certification and the Automation Competency Model in your companies. Most of all, we need you to be involved in building your profession. There are many ways to get involved. The International Society of Automation has Sections all over the world. If there is not one near you, think about starting one. Look at becoming certified and/or developing a training program. Mentor a group of young people. The opportunities are endless. It is time we as automation professional become proud of our profession. We need to mentor young people to stay interested in math and science and look at becoming automation professionals. We need to tap our military veterans that have highly specialized training and can be easily redeployed into automation careers with a small amount of training. We need to stand up and be heard. The task looks daunting but it must start somewhere. A small group of us started just a few years ago and we have accomplished a great deal. Just think of the possibilities when more people get involved. Dean’s 20+ year career has dealt with manufacturing and automation. He serves the automation industry in many capacities. He serves the 250 automation professionals of Glenmount Global Solutions as VP of Automation and Information Solutions. He is an active Senior Member in the International Society of Automation and serves on the ISA99, and ISA101 Standards Committees. He is active with Automation Federation. He actively mentors others in the profession and recently started an automation profession blog to continue promoting the profession online (www.automateeng.com). Dean is a 2010 Control Engineering Leaders Under 40. He is member of Project Management Institute’s Troubled Projects and Automation Communities. I have been unable to allocate the time required to keep this blog fresh. I am making a new years resolution to keep it more current. Stay tuned. Next week will usher in a new wave of prosperity for the Automation Profession. Stay tuned and hear what it is!! The Summary discusses how the Automation Competency Model is being put into action. This Case Summary illustrates the commitment by DOL to keep the Automation Competency Model front and center to address the need to develop the “Next Generation of Automation Professionals” and to also show the strong partnership that has been forged between the DOL and AF. See the note below from Mike Marlowe. The article is important but I also want to introduce you to a very important person to our efforts. For those of you that don’t know Mike, he is staff for the Automation Federation. He has been crucial in our efforts to build the profession. Mike is very well connected in Washington DC and has been instrumental in getting our meetings set up with the ministry level folks in the US government and other international organizations. We simply would not be as far as we are today with the efforts of Mike. The Automation Federation was started by the ISA as an organization of similar organizations. The strategy is that together, we can accomplish more. The Automation Federation got off to a rocky start and quickly discovered that their strategies had to be redirected toward defining and championing our profession in an inclusive manner outside of ISA. Unfortunately, there are still a few ISA volunteer leaders and others who either do not comprehend the value of the Automation Federation or have not taken the time and effort to understand what AF accomplishments mean to the profession and ISA itself. Yes, the ISA is the only funding source right now but for the minimal budget that it has allocated, we are accomplishing great things. The small band of active volunteers in the AF are doing all of their work without receiving funds from AF or ISA for travel unlike some other volunteer leaders in ISA. With a focused mission, AF is now a clear powerhouse in accomplishing what it is tasked to do. I personally find it satisfying that ISA sponsors this organization and that more leaders now understand the ramifications to the Society and to Automation with each successful AF initiative. If the mission of the ISA is to represent its members, AF’s is to represent the automation profession where it is unrecognized for the vital key to manufacturing that it is enlisting the help of ISA and other like-minded organizations who are AF members. Thankfully, recent ISA staff and volunteer leadership have diligently worked to make this reality. I would like to ask you all to let your ISA leadership know that you support the work of the Automation Federation and the importance of CAP. And, if you get a chance, send a thank you to Mike. I have been making a lot of updates to the supporting pages of the site. That plus getting some papers ready for the ISA Automation Week in October have left little time to actually post. But have no fear, time is starting to free up and I have several ideas for new posts. Throughout my career as an Automation Professional, I have noticed two distinct types of programmers. Those that just take what the spec says and programs for that and those that use the spec as a guide to develop a control system. Unfortunately, there are no courses on the differences in the two for automation folks. For some reason, automation programmers feel there systems don’t need the kind of rigor that traditional software development professional follow. In fact, I was told by one quality manager for a major systems integrator that they did not develop software and therefore, would not receive value from software development tools and methodologies. The classic battle lines between Engineering and IT would tell us there is not much Automation Professionals can gain from our IT brethren. I disagree with this assertion as software development life-cycles and more specifically, software testing is an area that the Automation Profession has much to gain. I am reminded of these principles when hearing of the one of the Toyota sticky gas pedal fixes. Some brilliant person decided to add a “feature” that would disengage the throttle when ever the brake pedal is depressed. Really?? Is that not what every single cruise control device already does? How could something so simple be missed during design, development and testing of the software controlling that process? Thinking back to a man-made disaster at Taum Sauk Generation Station in Missouri (http://en.wikipedia.org/wiki/Taum_Sauk_Hydroelectric_Power_Station). It is a simple enough concept, a pumped storage electrical generating system. During the day, a reservoir of water at the top of a mountain is allowed to flow through two generators creating electricity. At night, the generators are turned into motors and the reservoir is refilled with water from the lake. Over time and through cutbacks, the once fully manned station became remotely monitored and controlled, not that it would have mattered in this instance. One night, during the pumping cycle, the level measurement system failed and got stuck at a single low reading. Well, the pumps never stopped and overflowed the resevoir which quickly eroded a poorly constructed wall which emptied the full reservoir in a matter of seconds. The environment damage was significant as it created a trench down the side of the mountain and a lot of flooding. It nearly killed the Johnson Shut-in’s Park Ranger and his family as they woke up to their house floating down the river. A lot of emphasis was placed on the poorly constructed walls but what about the poorly developed control scheme. This “accident” should have simply never happened!!! We can assume the level control was simple enough. When level gets low, stop the generators and turn the pumps until level is high and stop the pumps. Now, this is a test for all of you readers. What other things could we have interlocked the pumps on. Well, how about stopping the pumps if the level does not change for a defined period of time thereby indicating something is wrong. Or, since this system has been running for years, someone should have had some idea how long it would normally take to fill the reservoir. So, lets stop the pumps after a certain total amount of time has elapsed. That is the simple stuff and would have cost a few extra key strokes in a program. Even if the system was still relay based, a PLC could have been implemented just for this piece at the costs of less than $10,000. It would be very interesting to learn what really happened and how many engineers made the call that this could happen and some bean counter could not justify the additional safety measures. What other failures do you know of that could have been easily avoided had someone thought through the problem from a failure standpoint instead of everything is normal? How many of these type of failures go on everyday in our plants? How many times does a knowledgable operator keep a control system from making a dumb mistake because of an arrogant programmer? I believe the numbers are much higher than we would like to assume. So, the next time you are out to start your next programming assignment, take a few minutes and think about what could go wrong and how your design will react to it. It really is not that difficult to take care of a majority of the issues any system will face.